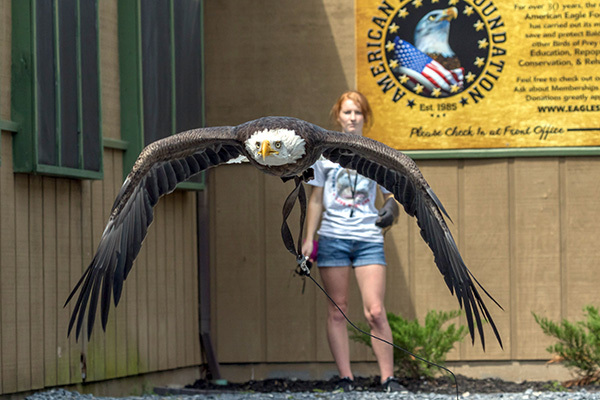 Challenger the Eagle receives his daily exercise. 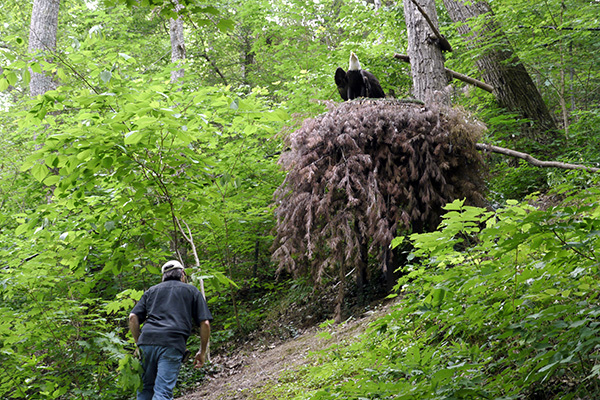 Former AEF President Al Cecere approaches Independence and Franklin's nest for a well-check. 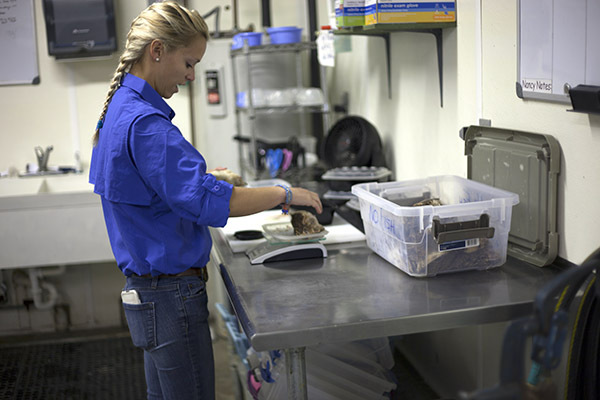 Each bird at the AEF receives a custom, monitored daily diet. 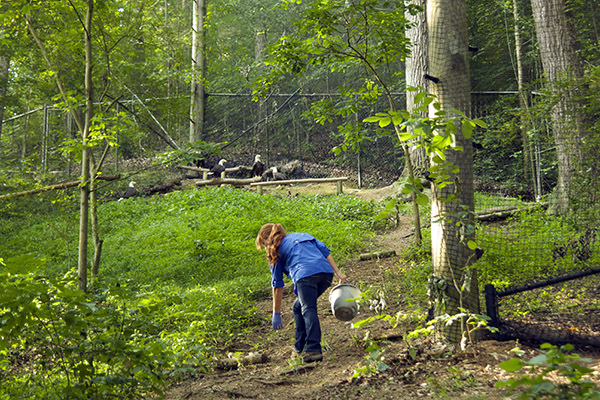 AEF breeding pairs receive fresh water twice weekly. AEF residents are weathered as often as possible for sunlight and relaxation. Wings of America star 'Mikie' prepares for a feeding during the next show! Mr. Lincoln receives his daily exercise! 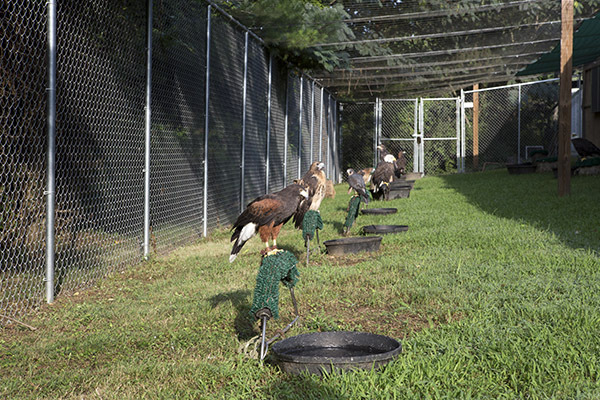 Residents of Eagle Mountain Sanctuary receive ample fresh food daily. 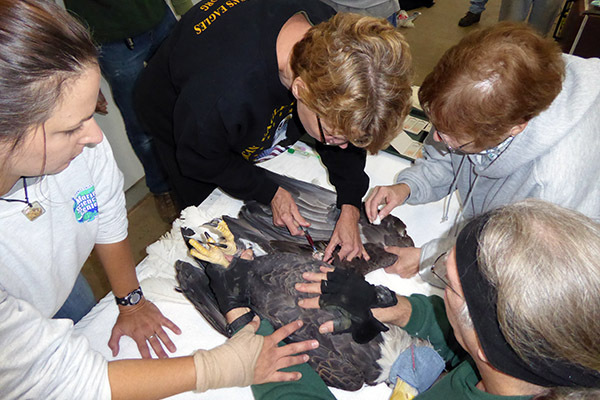 AEF residents are given checkups by Avian Veterinarians annually. 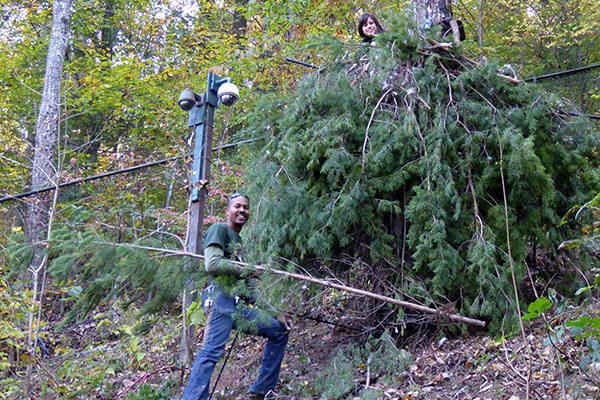 AEF Staff refurbish a nest in Eagle Mountain Sanctuary. 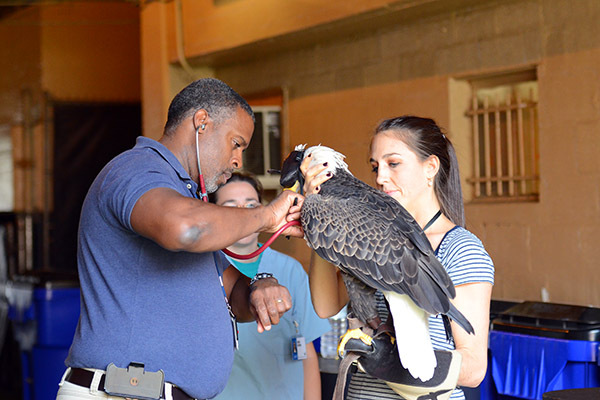 Challenger the Eagle receives monthly checkups to ensure he is healthy to travel. 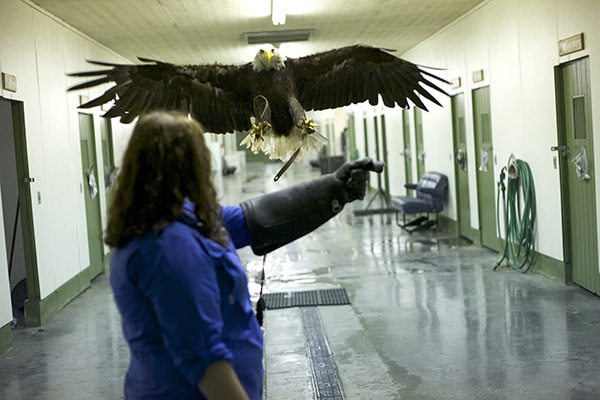 AEF is federally and state licensed to administer daily care to their 70 resident birds of prey daily. These birds are non-releasable due to permanent physical disabilities or accidental imprinting on humans. 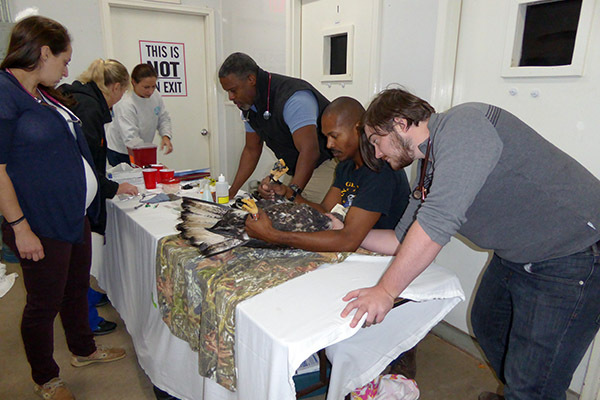 Each day, the educational birds are taken out of their enclosure for cleaning, feeding ,exercise, well checks, and outdoor weathering. The birds are weighed and their food is prepared accordingly. Their diet is species-specific and ranges from a variety of foods such as quail, rabbit, trout, mice, rat, and beef heart. We try to allow the birds as much sunshine as possible, and they are regularly exercised based on their abilities. Sometimes the birds are flown from person-to-person or person-to-perch, while other times they do jump-ups. 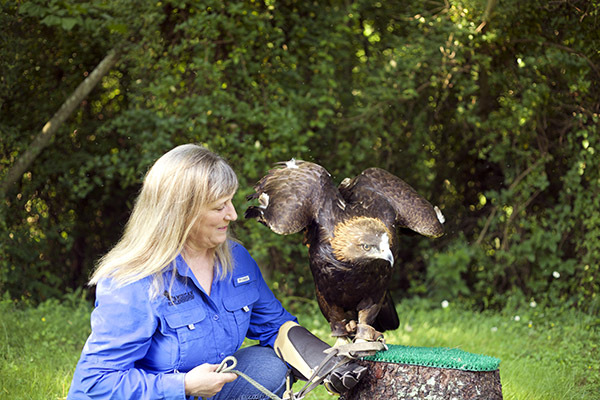 Our non-releasable Eagle breeding pairs at Dollywood’s Eagle Mountain Sanctuary and those in the breeding aviaries at AEF headquarters are also cared for daily. 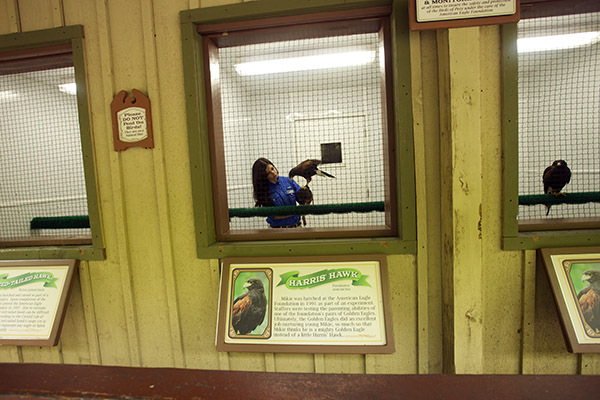 The Eagles are fed a variety of food each day such as rat, rabbit, quail and trout.